It was a super cold, snowy day in Utah. I flew up there in December to attend my nephew’s wedding and we were looking for a phenomenal place to eat lunch. A friend of mine told me that Cubby’s was a must try and I completely trusted her recommendation. Everything is made in-house and from scratch. Hook, line, and sinker. Since I was on vacation, I ordered the burger. Not just any ordinary burger. It is called the Dragonslayer burger. 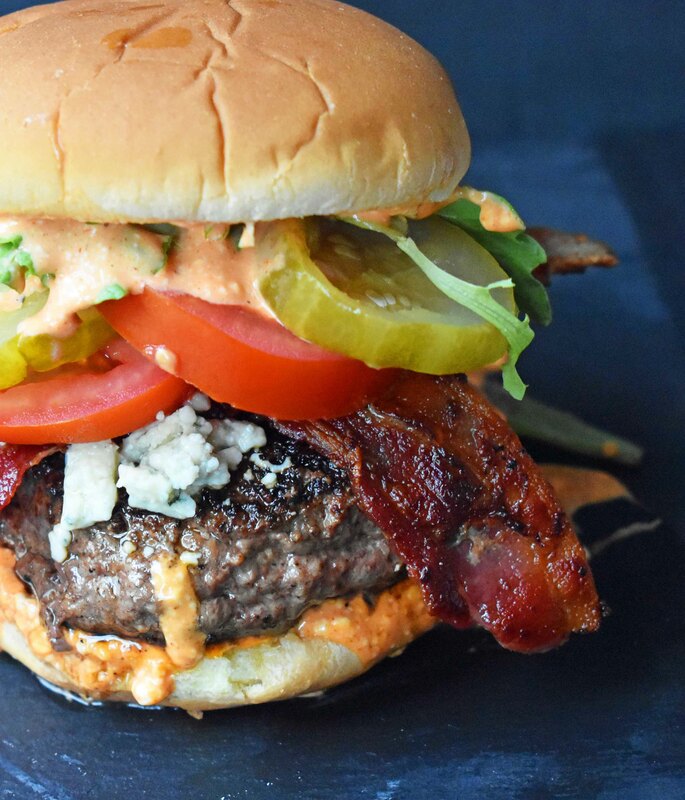 The description was off the charts….a top sirloin patty, blue cheese crumbles, smoky bacon, juicy tomato, crispy pickles, spring mix, and a creamy buffalo sauce. Word. I ordered it in 2 seconds flat. It was everything I imagined it to be with so many unique flavors going on. It had smokiness, creaminess, freshness, and was beyond savory. We left that day and I was already craving another one. Like any normal, food-crazed person would do, I went back the next day. It needed to be replicated at home because making a REALLY GOOD burger is an essential life skill, right? Haha! 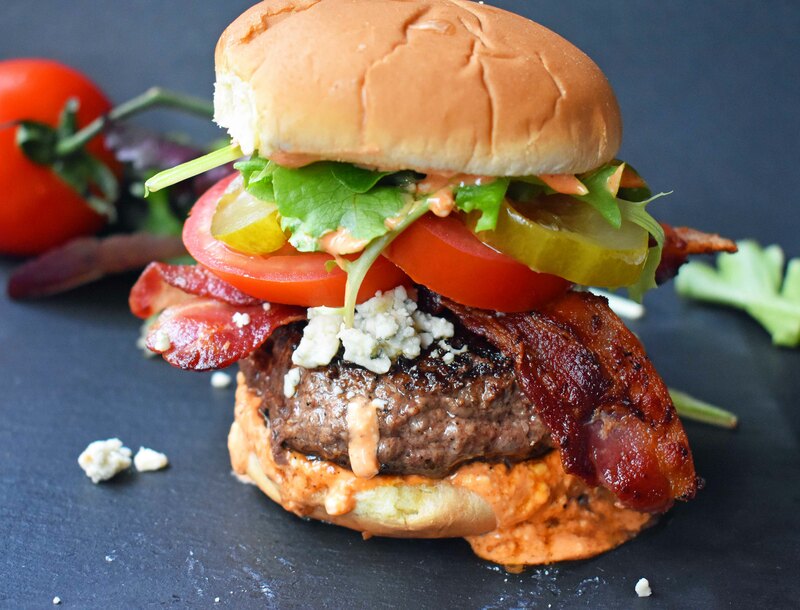 Needless to say, the family went absolutely crazy over this burger and wanted to drink the creamy buffalo sauce. It’s basically a marriage of hot wing sauce and mayo. Ridiculous. Use 80% lean beef. Now if you want it to be extra juicy, go for 73%. The balance of flavor and juiciness of 80% lean beef just seems right for a burger. The patties can be made to desire thickness. Season the ground beef well. We keep it simple with Lawry’s Seasoned Salt and Pepper, generously sprinkled on both sides. The key is to make the patties wider than the bun because the meat shrinks as it cooks. Bobby Flay taught me to always place a small indention with my thumb in the center of the beef so that it doesn’t puff up in the middle. Thank you, Bobby! Get that bacon nice and crispy. No soggy bacon on burgers! Center cut bacon crisps up so nicely. I am officially salivating. Make that creamy buffalo sauce by mixing hot wing sauce and mayo. It may be simple but holy cow it’s good! Use your favorite type of lettuce. You can use spring mix, romaine, iceberg, or whatever you would like. 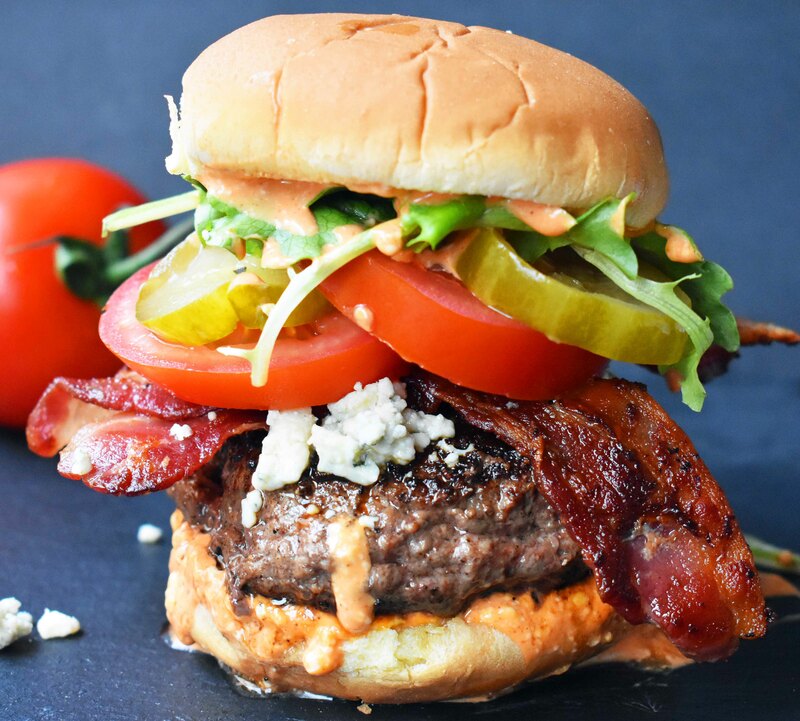 The Dragonslayer Burger is made with high quality beef seasoned to perfection, blue cheese crumbles, smoky bacon, juicy tomato, crisp pickles, spring mix, and a creamy buffalo sauce. Heat grill to high. For 1/2 lb. burgers, make 4 large patties. For 1/3 lb. burgers, make 6 patties. Press down so the meat is larger than the bun, as it shrinks as it cooks. Press the center of the meat with thumb to make indention so the meat doesn't puff in the center. Season generously on both sides with Lawry's seasoned salt and pepper. Cook for 5-8 minutes per side or to desired degree of doneness. Cook bacon in skillet, oven, or microwave to desired crispiness. To make creamy buffalo sauce: in small bowl, combine mayonnaise and hot wing sauce. To assemble Dragonslayer Burger: Spread creamy buffalo sauce over buns. 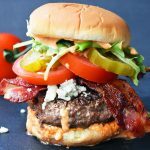 Top with burger, blue cheese, bacon, tomatoes, spring mix, red onion (optional) and pickles. This burger was off the charts good! That sauce! I did the bacon in the oven with a little maple syrup! Our family’s new favorite burger.